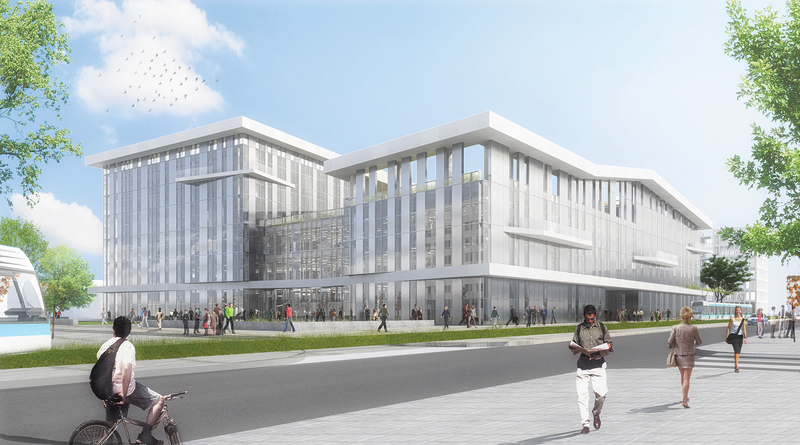 Structuring the heart of the campus, the Campus condorcet’s Library will become a major focal point of animation in the Condorcet Campus area, its district and the entire city. The catalogs of 45 libraries specialized in human and social sciences will be open to all the institutions of the Condorcet Campus, the scholars and to the public. 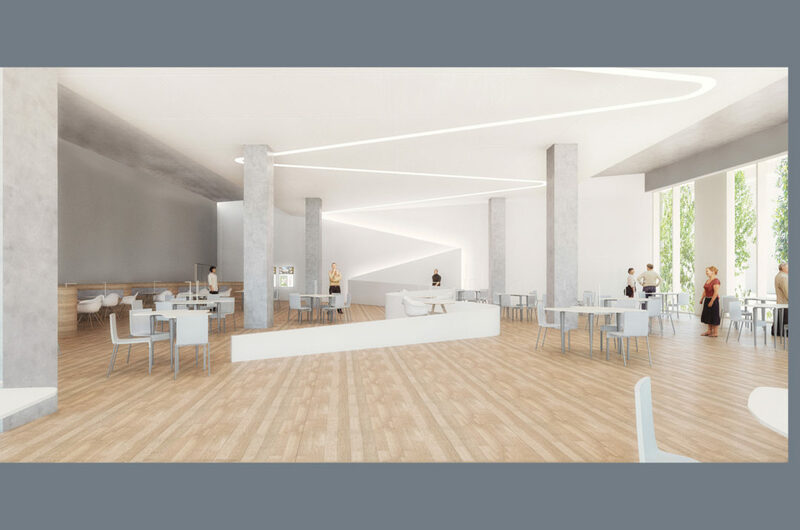 The building will offer a consultation space with a capacity of 1432 seats, some logistic spaces including archives and reserves, a forum, a cafe, a bookstore, and some public gardens. Some exhibitions will be open to the public, and work spaces will be available for students and residents. The library is made of two asymmetrical volumes, connected by two other above the ground volumes, which are delimiting the large central interior forum. Placed on the north-south axis, it is becoming a natural meeting point open to a variety of passersby. Mainly made of glass the bulding architecture is highly open to the outside and enable the passersby to grasp at once the ground floor services, inviting them to discover the inside of the building. 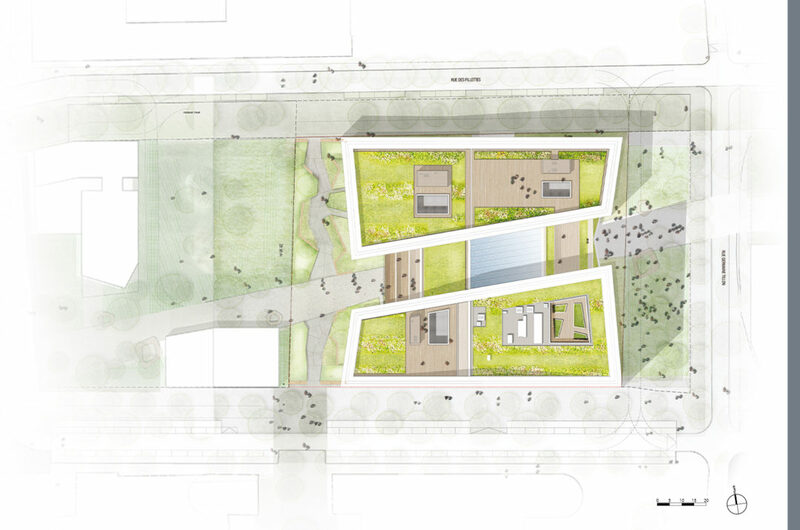 The ubiquitous link between the inside and the outside space offers to the researcher a multitude of outdoor facilities. 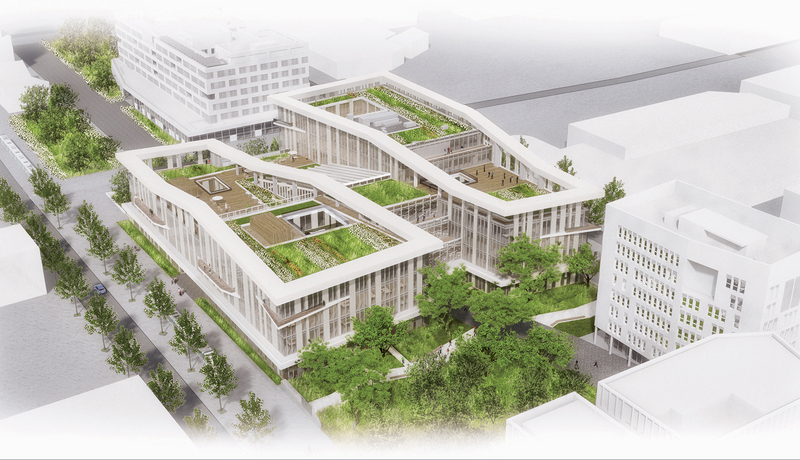 The inner rooms extended to the outside offers outdoor workspaces, terraces and balconies. The forum, heart of the equipment, is the first contact between the public and the building and between the interior and exterior spaces. 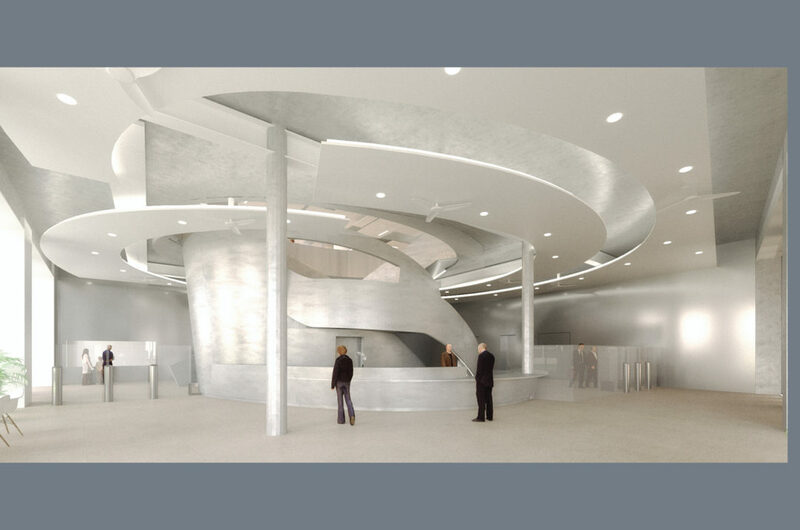 A Great flexibility is provided to embed the future extensions within the newly built surface. A Set of oblique light gray slabs and metal balconies penetrate the angle of the building to create a «movement» and lighten the masses. The project is focusing on saving resources, while providing aesthetic, qualitative and functional spaces to maitain a peaceful environment for study and research. 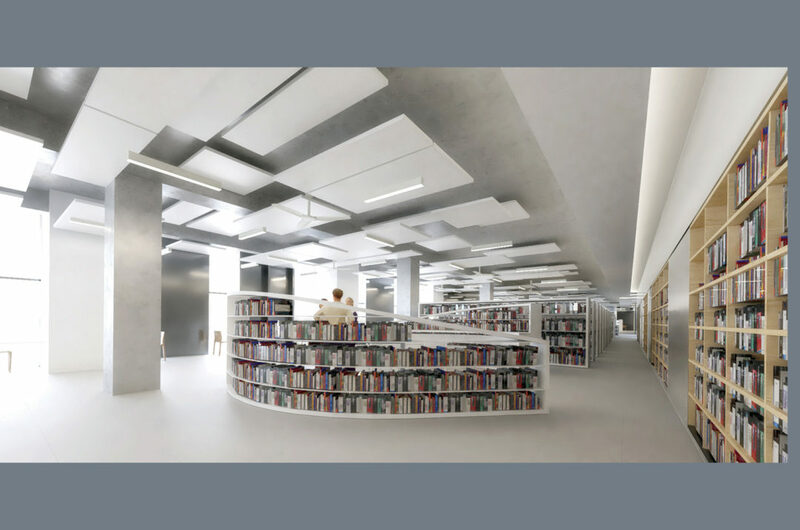 The spaces are bright, the treshhold are proposed in hierarchy for the reading rooms, playing between public and intimate spaces, constantly linked to the outside. All of these provisions provide a passive high performance energy building. Furthermore, the filtration efficiency of ventilation provides optimal air quality. 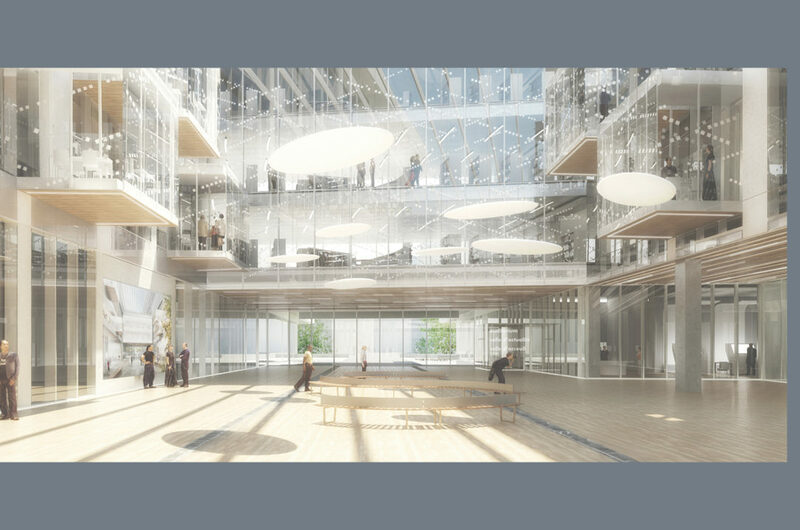 The forum will be covered by a canopy of «sheds» to bring natural light, warmth in winter, and to bring natural ventilation in summer, ensuring the evacuation of warm air. 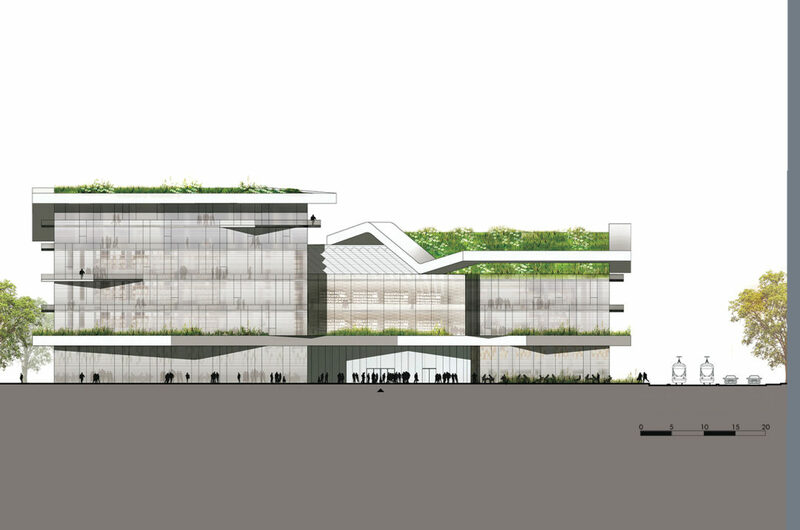 This system highlighted in the design conception illustrates very well the «low tech» characteristic of the project. 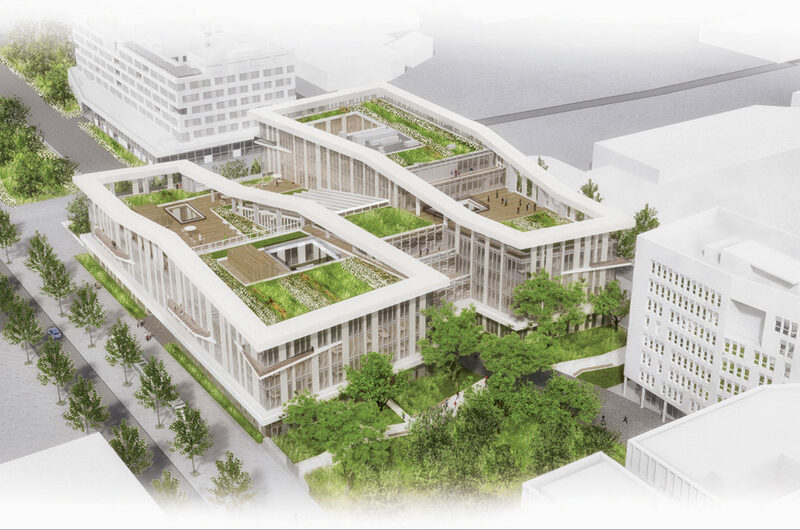 The two main volumes are both equipped with a roof garden terrace, increasing the thermal inertia of the building countering the runoff phenomena related to soil sealing while enhancing the view of the buildings surrounding. 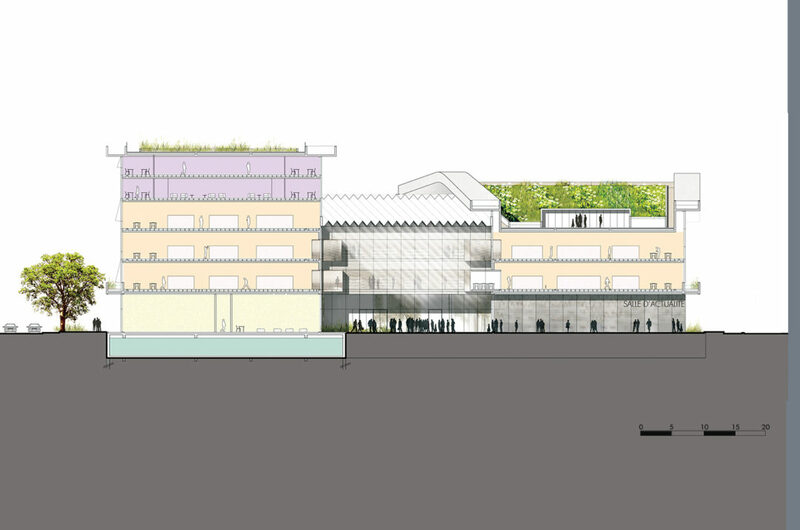 Partially accessible to the public, these terraces, also participate to define the lookout of the Condorcet Campus. The catalogs of 45 libraries specialized in human and social sciences of the library will be open to all the institutions of the Condorcet Campus, the scholars and to the public. 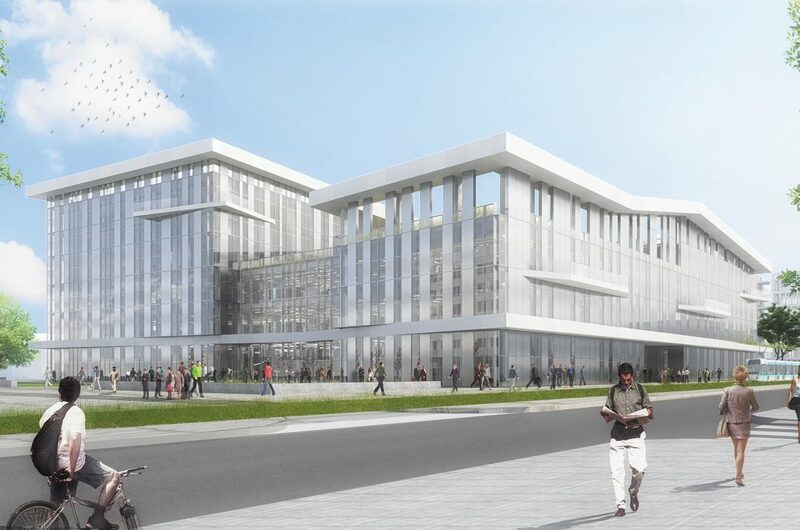 The building will offer a consultation space with a capacity of 1432 seats, some logistic spaces including archives and reserves, a forum, a cafe, a bookstore, and some public gardens. Some exhibitions will be open to the public, and work spaces will be available for students and residents. Layout of the Germaine Tillion’s parvis.